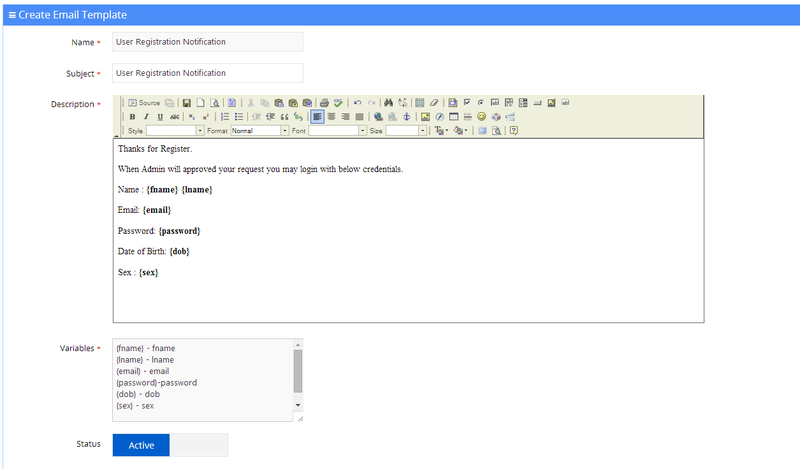 In this tutorial, how to manage email Template content on Yii Back-end? I see that you have some down votes, but no explication. I think that proposing a method for email templates is a nice idea, but the implementation here is not a good example. Create the table using a migration and use the table creation method of a migration. What is the reason for 'to' in the template table? The template example seems to be incomplete. The controller code starts of good by using a dedicated scenario "register" but that feature is not used. $_POST['VkUsers'] is assigned to the model's attributes, but there is too much code related to the use of the attributes in the controller. Put that code in the model (create a getter getDob() which computes the value from the model's properties. You assign to the model, but then still use the 'POST' values directly rather than using the validated and safe model values. SQL injection is mossible thanks to FindEMailTempalte - so a security issue - use parameters when data is coming from a user.